Everyone has their favorite mac and cheese recipe. Whether you love Velveeta or sharp Cheddar, Kraft in the box or the homemade, baked variety, there are few who can resist the homey temptations of ooey, gooey, comforting mac and cheese. I am probably one of the few Americans who didn’t eat it, or even like it, growing up. I discovered it near adulthood, and it was a near revelation. Since then it has become a staple in my diet and repertoire, my favorite thing to make after a late night out, a wonderful, hearty dish for cold nights or after a long day. This recipe is different from others. It’s grown-up. The kids will probably like it, but this is really a recipe for adults. The recipe I’m about to share with you is for Mac and Cheese with Cauliflower and Creme Fraiche. Yup. Roasted cauliflower gets mixed in with cheesy, gruyere-studded pasta, creamy creme fraiche, sharp Dijon mustard, and fresh tomatoes and topped with crunchy breadcrumbs. Yeah. It’s as good as it sounds. And maybe, just maybe, it’s a little healthier than typical baked macaroni and cheese thanks to the cauliflower. This could fit in with the whole Jessica Seinfeld hide your veggies so the kids will eat them mentality. This really might become my go to baked macaroni and cheese recipe. The flavors just meld, the textures play, and the tomatoes add a surprising touch – a spot of acidity and brightness so often lacking in most traditional, heavy mac and cheese recipes. There are also many ways to play here based on preference and what you have on hand. For kids I might omit or reduce the mustard and go with a less sharp cheese. You could do a rendition with broccoli and cheddar, leave out the tomatoes, or add some interesting spices. Me? I’m going to keep making it exactly like this. Preheat broiler. Cook the pasta until just al dente. Drain and Set aside. Meanwhile, toss the cauliflower florets with a little olive oil (just enough to coat evenly). Place in an even layer on a baking sheet and broil, shaking once, until lightly browned (time will depend on your broiler. Mine is junk). Remove and set aside. Lower the heat to 350F. Melt the butter in a large saucepan over medium-low heat. Add the flour and stir, 2 minutes. Gradually whisk in the cream. Cook until the sauce thickens, whisking occasionally, about 4 minutes. Add about 1½ cups of the Gruyere and whisk until fully melted and sauce is smooth. Whisk in about ½ of the Parmesan, then the creme fraiche and mustard. Add the paprika to taste and season with salt and pepper. Remove from the heat. Stir together the pasta, cheese sauce, cauliflower, and tomatoes. Spoon in half of the mixture to a large (13x9x2-inch at the minimum) baking dish. Sprinkle with the remaining Gruyere. Cover with the other half of the pasta mixture and top with Parmesan and bread crumbs. Bake pasta uncovered until bubbling, about 35 minutes. Allow to cool a few minutes before serving. I will have to make this when I can spot a cauliflower. Cauliflower I believe is an unutilised vegetable. Can be roasted, boiled, stir fried, mashed and more. Stired into soups, used as a base for pasta dishes, pickled etc. Great recipe. I completely agree! My absolute favorite is simply roasted cauliflower with some olive oil, salt and pepper, and shaved parmesan. Mmm and cauliflower soup! Yes. Thanks so much! I’ll take 15 scoops please! I have a mac & cheese obsession and this one sounds absolutely perfect to me! From the cauliflower to the tomatoes to the creme fraiche and gruyere. Heavenly! I saw this recipe in Bon Appetit,. but I have to say I think you made it sounds even more appealing than they did! What a compliment! Thank you (I’m blushing). Looks like we are on the same page here. I jjust posted a mac and cheese recipe too 🙂 Like you, I did not grow up with this dish and was not drawn to touch it until recently. I really like your version with cauliflower and tomatoes. There is no reason why we can’t have veges in it right? I will definitely add some to mine the next time I make it. Yes! I saw your mac and cheese. Bacon is a great addition, yummmm. Katherine, this look so delicious and I mean it. I never used or had creme fraiche. I must go find this. I’m keeping this recipe for future. Adding cauliflower is interesting twist. I don’t have enough cauliflower recipe, so I appreciate this recipe! Creme fraiche is so delicious! It’s kind of like a thick, creamy combination of yogurt and sour cream. I think that you could possibly substitute plain, whole fat (preferably Greek) yogurt here if you can’t find creme fraiche. It definitely is! (Again, I try to tell myself there’s something healthy in there with the cauliflower…) but as long as you don’t eat this for dinner every night (which I kind of want to) then it’s not too bad. Thanks so much for stopping by! Gruyere and creme fraiche are new to me, but I’ll google them out. I am very interested in Italian cooking right now. Your version of mac and cheese is truly distint and looks absolutely scrumptious. Can I substitute gruyere with something else? Thank you! If you can’t find creme fraiche then check out this link to make your own with just cream and buttermilk: http://www.joyofbaking.com/CremeFraiche.html. You can substitute gruyere with pretty much any cheese you like. Emmenthaler or comte are the closest but even Cheddar would be great here! I love cauliflower! I think it would go great in this recipe! It sounds delicious!!! Great way to have kids it their veggies! Definitely a great way to have kids eat their veggies! Love the addition of cauliflower here, but then I am quite the cauliflower connoisseur. This looks wonderful! Buzzed it. I just love cauliflower, and it works so well here! Thank you Carolyn. Oh I just love this! 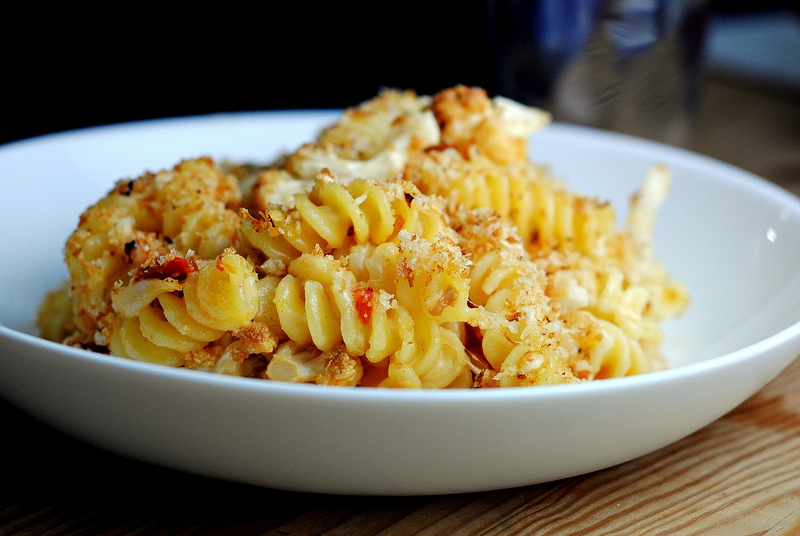 I would have never ever thought to add cauliflower to mac and cheese, but I’m totally trying it soon! I have added butternut squash to mac and cheese but I will have to try cauliflower as I love it with cheese! Think that I might add some chili flakes to Spice it Up! Just tried this recipe last night! Wonderful recipe and easy to follow. Sauce turned out amazing used smoked gouda and mozzarella. I also added 1 clove of garlic to the roasted cauliflower. Felt like restaurant style mac and cheese. Thanks for the great recipe.